Good-natured astronomer Sam is devastated when the love of his life, Linda, leaves him for a suave Frenchman named Anton. He therefore does what every other normal dumpee would do, go to New York and set up home in the abandoned building opposite his ex-girlfriend's apartment, intent on winning her back and waiting until she decides to leave her current lover. What Sam does not count on is being joined several weeks later by ultra hip tomboy Maggie, a photographer and motor-cyclist who is determined to get revenge on Anton, her ex-fiance. Hostile at first, the two of them eventually join forces in an attempt to separate the couple, and ruin Anton's life. However, complications ensue when Sam and Maggie start falling for each other. Excellent and totally under-rated. 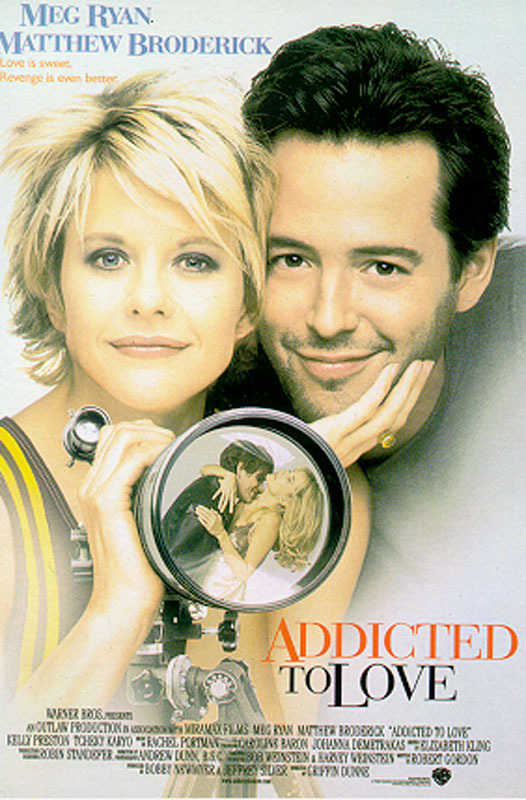 Meg Ryan did this justice and had a ball doing it., 26 June 2004 Author: Echaad from United States What is the problem with the voters on this movie?Does Meg Ryan ALWAYS have to be a sap? I mean, always the goodie two shoes?I love her romantic comedies, but this one had BITE. And it was funny as hell... how did it manage to score LOWER than her other movies?She's extremely likable as an actress, she is a very good actress, and in this movie she got to play someone with a little bit more range than she usually gets and she did it so well.. what is the problem here? Does everything have to be dumbed down in order for people to like it :(Addicted to Love is HYSTERICALLY FUNNY. Watch it again and appreciate it. Not everything has to be either sappy or have explosions to be good. Sheesh.